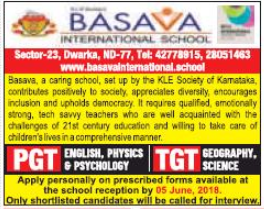 Basava International School, Delhi has advertised in THE HINDUSTAN TIMES newspaper for the recruitment of PGT plus TGT vacancies. Interested and eligible job aspirants are requested to apply with in 5th June 2018. Check out further more details below. About School: Basava International School has already made a big impact on the Capital's education scene by combining the values of a traditional society with the aspirations of a globalised generation. Set up by the well-known KLE Society of Karnataka, the school recognizes the need for quality education for the children who are growing up to face an increasingly competitive world. KLE Society runs about 290 educational institutions including well known-medical and engineering colleges around the country. This is one of the largest networks of institutions for higher studies and technical education in India. KLE will complete 100 years of its service in 2014.